Tales is coming to you with guest electric bassist/composer/arranger/producer, Jimmy Haslip. Back in August while playing with Michael and the band in Los Angeles, I had an excellent opportunity to invite this extraordinarily talented and humble gentleman to do an episode of Tales. We conducted the interview backstage after the show. Amidst the noise of the guys packing up and chilling out at the same time, I was able to find out even more information on this fascinating and hardworking musician. I first met Jimmy back in 1993 when he was still performing with the Yellow Jackets and I had begun touring with the Michael Franks band. As longstanding member and co-founder of the Jackets, Jimmy took an amicable hiatus from the group in 2013 to use the time to pursue other artistic challenges and most importantly, to focus on his family. From my own personal experience, when you are a successful touring musician you can spend 10 months on the road, so it made sense after touring and playing with the Jackets for 30 years, the time had come for Mr. Haslip to take a break. But Jimmy didn’t take “a break” per se, instead he only decided to take his brilliance and imagination and apply it to the new musical avenues that opened before him. I clearly remember when I first launched Tales from the Jazz Side, June 2013, with Michael Franks being my very first guest, and how grateful I was and still am, to him for sharing his time, life and brilliant mind. Each month I would work on getting guests for the show, recording them, lot of times while I was on the road with the band. Periodically, Michael would ask me how the show was going and if I needed any help. On one of our backstage chats he mentioned Jimmy Haslip as a possible guest and offered to connect me to him. The rest, as they say, is history. In looking back over the past two and half years of episodes and all of the great stories shared by the guests on those pass shows, it seems that what has been a reoccurring point, centers around the necessity for focused discipline coupled with hard work. If anyone represents that ideal it is certainly Jimmy Haslip. Next to Buddy Williams and the late James Brown, he has to be the hardest working man in show business. Besides his willingness to work smart and diligently, Mr. Haslip is a living and brilliant example of someone, whose love for music, for creating value in life and art, is the guiding force that motivates and inspires him to constantly embrace new challenges. As you listen to this interview you will wonder, where does he find the time? Well he does find time for his craft as well as for his beautiful wife and family. What an honor and a privilege to close out and open the year with this month’s guest. Jimmy Haslip, a musician steeped in old tradition, while simultaneously breaking ground for new tradition. A true innovator. And that is a very rare thing these days. Happy Holidays and thank you all of reading and listening!!!!! Jimmy Haslip was born December 31st, 1951 in the Bronx, New York. He grew up in Huntington, Long Island. In 1963 at the age of 13, he became interested in electric bass and has now been playing for 47+ years. Jimmy left New York in 1969 playing music in San Francisco, New Orleans, Denver and Dallas before moving on to Los Angeles in late 1975, where he began touring and recording with many different popular artists. In 1978 he met guitarist Robben Ford and keyboardist Russell Ferrante and formed a group to record Robben’s first solo recording on Electra-Asylum. This critically acclaimed album, called ” The Inside Story” became a landmark recording. That album led to the formation of The Yellowjackets and in 1980 they recorded a debut album for Warners Bros. Records. 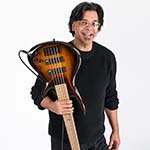 Jimmy is actively composing, arranging, producing and performing with Yellowjackets, who will be touring and promoting their newest recording in 2011, their 21st CD entitled “TIMELINE” on the MACK AVENUE recording Label. Yellowjackets, the two time Grammy winners, have been nominated for seventeen Grammy’s. Jimmy was also nominated for an Edison award in 2000. and this year, another Grammy nomination, his 18th for the Jeff Lorber Fusion “NOW IS THE TIME” recording.which he co-produced. This entry was posted in Podcast and tagged Al Jarreau, Alan Pasqua, Allan Holdsworth, Anita Baker, Bruce Hornsby, Bruce Kulick, Chad Wackerman, Chaka Khan, Donald Fagen, Eric Marienthal, Gino Vannelli, Jaco Pastorius, Jeff Lorber, Joe Vannelli, Kiss, Marilyn Scott, Micahel Franks, Michael Bolton Allan Holdsworth, Red Heat, Rita Coolidge, Robben Ford, Sandy Gennaro, Tommy Bolin, Vinnie Colaiuta, Virgil Donati, Yellowjackets. Bookmark the permalink.